Although barbecue season has passed, last weekend proved that it’s never too late in the year to huddle around a roaring fire. Famed for his eponymous Michelin-starred restaurant in Stockholm, Niklas Ekstedt has released an open-fire cookbook ‘Food From The Fire’. Throughout the book, the chef attempts to deliver accessible Scandinavian recipes, all of which are intended to be cooked outside, over fire and are – most importantly – not too difficult to recreate outside of a high-end restaurant kitchen. To make the raw red cabbage salad, slice the cabbage thinly – easiest on a mandolin – and rinse in cold water. Drain and place in a bowl with the salt. Mix well, cover with clingfilm and store in the refrigerator for 3–4 hours. In a saucepan, combine the vinegar, sugar and spices in 140ml/5fl oz/generous ½ cup of water and bring to the boil over medium heat, stirring until the sugar has dissolved. Remove from the heat, leave for 10 minutes and then strain to remove the whole spices. Leave to cool. Rinse the cabbage in cold running water for 5 minutes. Drain well. Place in a bowl, add the sugar and vinegar liquid, and store in the refrigerator for 24 hours. To make the meatballs, heat half the butter in a saucepan over medium–high heat, add the onion and sauté until soft but not coloured. Remove from the heat and leave to cool. Put the breadcrumbs in a bowl, add the milk and cream and leave to soak for 5 minutes. Combine the onion, salt, pepper and juniper, then add both meats and mix well (but don’t overwork, otherwise it will get too warm and split). Cover and store in the refrigerator for 30 minutes. To make the caramelised red cabbage salad, cut out the core of the cabbage and cut the cabbage into roughly 2cm/¾in cubes. Melt the butter in a saucepan over medium–high heat. Add the cabbage and onion and sauté until soft. Add the sugar, vinegar and bay leaf and simmer until all the liquid has evaporated and the mixture starts to caramelise. To make the blackened apples, cut each apple into 16 wedges. Spread the apple in a cast-iron pan and place over medium–high heat. Roast until the apples begin to release liquid. Turn up the heat and caramelise the surface until almost burned. Remove from the heat, add the butter, let it melt and mix it around with the apples. To make the mashed potato, heat the milk, cream, bay leaf, peppercorns, nutmeg and onion skin in a saucepan over medium heat to just below boiling point. Remove from the heat, cover and leave for 20 minutes. Meanwhile, cook the potatoes in salted boiling water until tender. Drain and leave in the pan with the lid off until the steam disappears. Strain the creamy liquid. Mash the potatoes, add the liquid and whisk to combine; whisk as little as possible to prevent the potatoes becoming gluey. Add the butter and season with salt to taste. Preheat the oven to 150°C/300°F/gas 2. Wet your hands and shape the meat mixture into small meatballs. Heat the remaining butter in a frying pan over medium heat and fry the meatballs until golden brown all over. Transfer the meatballs to a baking tray and cook through in the oven for about 10 minutes. 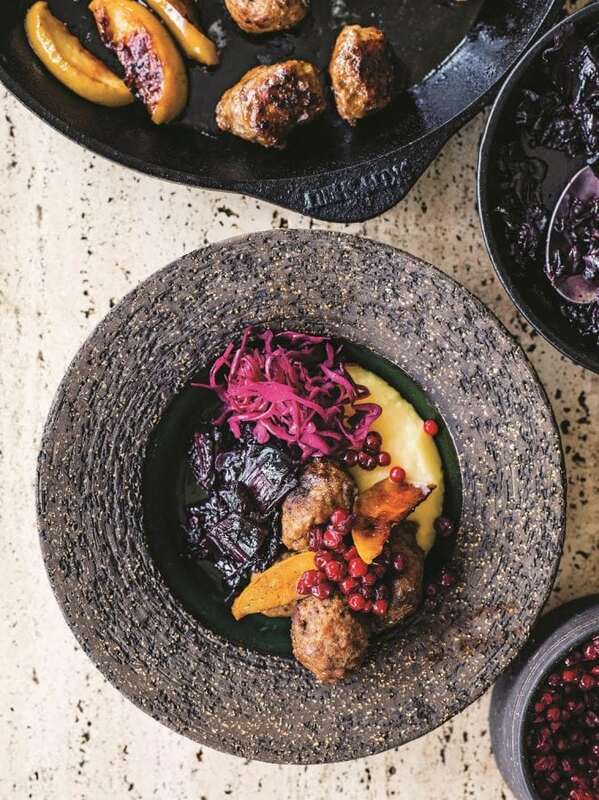 Serve the meatballs with caramelised red cabbage and raw red cabbage salad, blackened apples, mashed potato and lingonberries. This recipe is adapted from ‘Food from the Fire’ by Niklas Ekstedt, published by Pavilion. Recipe photography by Haarala Hamilton.